What do you hope to accomplish within the first semester of your presidency? A focus of mine this semester is sustained, strategic listening. I want to hear directly from students, faculty, alumni, parents, staff and friends, including our friends in Richmond, to understand what they value most about William & Mary and their hopes and dreams about the future. Those conversations have already started this summer with alumni and with the students and staff on campus in a lively way. As the semester gets underway, I would like all members of the community to have an opportunity to join this listening process, and I will soon announce ways for everyone to share their aspirations and challenges with me either in-person or online. You have talked about “strategic listening.” What does that mean? For me, this means an active and intentional process of listening. Over the course of the first few months, I’m listening for overarching themes that I can reflect back to the community. And I’m particularly interested in hearing creative ideas about the future, including: how to continue the upward trajectory of pre-eminence that William & Mary is on; how to sustain our core values during a period of rapid transformation in the way we work and the world we live in; and how together, we can shape the kind of community we aspire to be, in the context of those changes. William & Mary cherishes its deep history. It was founded with the incredibly forward-looking and bold charge to pursue learning for “all time coming.” If we take seriously that charge, then we need to think beyond the short-term. We should be asking ourselves with deep curiosity: what’s on the horizon over the next 10 to 20 years? Exploring that question in its different dimensions is what will ensure our vitality and prosperity for the future. What will the future of work look like for our graduating students and our alumni? How are their lives as professionals changing — what kind of careers might evolve and how can we best prepare our students for careers that don’t currently exist? What will the future of our disciplines look like? What is thrilling about the changes you see in your fields? What is daunting? What will be the future of learning — and particularly, the future of learning at an institution with the interdisciplinary breadth that we have at William & Mary, bringing Arts & Sciences together with professional schools? What is the future of citizenship in a vibrant democracy? What is the future of communication and connectedness: how will we create and sustain our communities? How will William & Mary continue to be a place that makes history; to be known broadly as an institution that convenes great minds for the common good? As I mentioned earlier, I will spend the first half of the semester meeting with groups, both large and small, to explore these questions with different constituencies. I will then reflect back to the community some of the common themes I hear. These will be the basis for future planning. Can you say a little bit more about what you mean by “reflect back”? That moment of engagement and reflection is essential before moving forward to more systematic planning processes. In your early conversations with alumni, students, faculty, parents, friends and staff, has there been a consistent theme or message that has been conveyed, that stands out to you the most? One common theme I’ve heard many times is a deep commitment to our students and delight in who they are. They bring so much intellectual and human vitality, and such a strong sense of service to their communities and the world. I tell alumni and parents all the time that this is an exceptional generation. I have so much confidence in the history they will make. I’m also struck by the emphasis on collaborative intellectual discovery at William & Mary. Such a large percentage of our undergraduates participate actively in primary research — over 80 percent of seniors in one estimate. We are a teaching university and that is something to celebrate and continue to invest in. Graduates of William & Mary will have developed an essential capacity to work at the edge of knowledge, in arenas where the answers are not yet known. That’s a very powerful preparation for professional life and citizenship in the 21st century. Above all, the commitment to excellence is clear everywhere. We are an institution that expects excellence of ourselves. Whether it is in performance, in the arts, in athletics, academics or in engagement with the community. It takes work to achieve such a strong sense of shared commitment to excellence. That’s a value I share. You asked about common themes but I’m also interested in outliers. It’s important for different parts of our community to have a chance to hear each other and to understand each other’s priorities. One of the important roles a president can play is to help us hear our differences with appreciative curiosity and respect. We are part of a whole that is diverse — with both convergent and divergent interests. A sense of community and shared purpose grows out of that capacity to appreciate and be curious about how we differ. With a little over two years left in the For the Bold campaign, what do you see as the greatest accomplishment? What about the greatest challenge? First, I am thrilled we set the bar high for this effort and really believe in the name of the campaign. It’s on all of us to fulfill what it means to be bold — and to put that into practice. We should all be proud that the university has already surpassed $800 million toward our $1 billion goal. This is a wonderful milestone to have achieved and is only possible because of our deeply committed alumni, parents, students, faculty, staff and friends. I’ve been able to witness the impact of the campaign through so many of the people I’ve met. That has been truly remarkable. It is a showcase of Tribe Pride throughout our community. We also set the bar high with respect to alumni engagement. This is a challenging time for all institutions of higher learning with respect to engagement and participation, which has steadily decreased at most institutions around the U.S., both public and private. It’s a powerful statement that William & Mary has seen an upward trend. What I’d like to ask our alumni is how we, as a community, can continue to be innovative in this arena. William & Mary should set the standard for the nation in how we reach into our community to build an even greater sense of shared purpose. Our future depends on alumni participation to sustain excellence in academics, in service and in athletics. But to sustain this level of excellence we must match it with resources. I’m also interested in working with younger alumni and students to explore what it means to them to be joining a community that is committed to supporting future generations. I think this rising generation of graduates is ready to create among themselves that sense of responsibility. At William & Mary, our aspiration is for the most exceptional students to attend — regardless of their ability to pay. That’s why there continues to be so much focus on our Affording Opportunity scholarships effort. I want us to be a leader in this area. Why is it so important for alumni to remain active members of the William & Mary family throughout their lifetimes? At William & Mary, we’re in the business of building lifelong relationships — relationships that last beyond a student’s time on campus. We have the great privilege of beginning our relationships with human beings who are still discovering who they are. We invest in their transformation now, on behalf of their and our future, knowing they will become leaders in their communities and in their professions. Being active members of the William & Mary family means coming back to campus often, mentoring our students and learning from them in turn about the world they are growing up in. It means letting us know what matters to you. It also means thinking about philanthropy as an investment in future change via this extraordinary relationship that lasts a lifetime. This way of thinking should start when students first come to William & Mary. A two-part question: You’ve spoken often about the need for universities to be innovative, especially in how they prepare students to be successful in jobs that in many cases don’t exist yet. Can you talk more about how the educational experience at W&M can do that? Also, how can we be innovative while still being true to our core traditions and values? First, let me share a little about how I think about change — something I talk about a lot. I am a Renaissance scholar, as most people know. I was attracted to studying that period not only because it was a period of great works and the time when critical foundations of our democracy were laid. I was drawn to this period because such moments of founding — the founding of a nation or the founding of a college — are moments of rapid transformation. Those acts of founding come out of economic, technological, as well as religious and political transformation. In the 17th century, when William & Mary was founded, new print technologies rapidly changed how knowledge was circulated, expanding literacy at all levels of society and creating a new sphere of public discourse. So, I look to all traditions both for what they tell us about what lasts and for the history of transformation to which they testify. The moment when traditions are created and the purposes they are created to fulfill are often transformative moments. This university has a deep history of successful transformation through multiple periods when it almost failed, or when it did fail and then “pivoted” — as entrepreneurs would say — and that pivot led to incredible success. 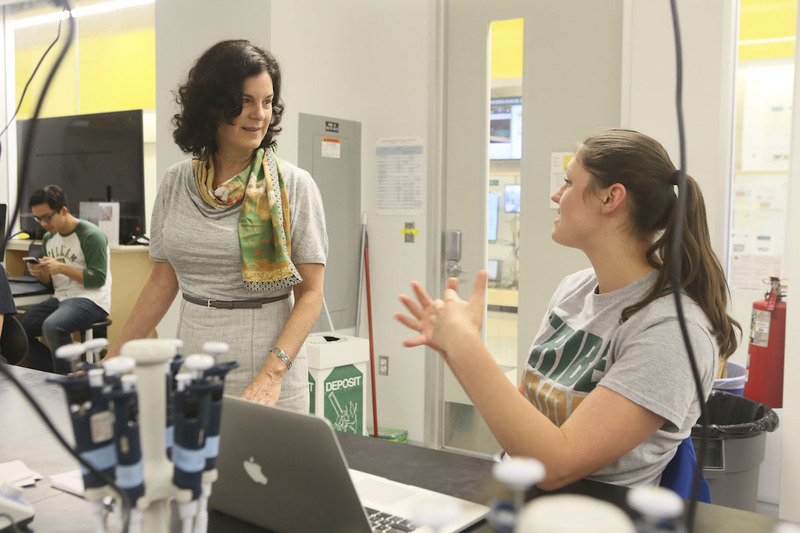 The entrepreneurial and innovative qualities of William & Mary sustain our core mission. We have preserved our mission via transformation. A couple of years ago, a student and I were talking about the building of a new library. As we all know, a lot has changed in the way libraries are used and how they support learning today, and we were debating those changes. At one point she said, “We change in order to preserve what we value.” She couldn’t have put it better. When change occurs, you learn a lot about your values that you might not have articulated fully before. Any process of transformation, if done reflectively and intentionally, can be a process of affirmation: coming to understand what you hadn’t really known you valued. So much of the recent research into workplaces of the future tells us the same things: successful professionals in every sector will be those who are adaptive, agile and great critical thinkers. Those with a strong community ethos — the ability to collaborate as well as lead — will contribute the most to shaping their fields. Ten years from now, half of the jobs our students currently graduate into will no longer exist. Over the course of a career, our alumni will many times re-imagine themselves by learning new methods, developing new sets of skills, working with new kinds of data, questioning assumptions and evolving their ways of thinking. The breadth of the education offered at William & Mary — where students are learning to think critically and ask questions that matter — is the best preparation for a life and career as learners. In order for professionals to succeed, and for citizens to shape their nation, they need to know how to pivot as the world quickly evolves, in a way that’s anchored in the core missions and values of their workplaces or communities. One thing that strikes me as I talk to William & Mary students is how common it is for them to be studying in multiple, very different fields. In fact, our students pursue double majors at among the highest rates of any university in the U.S., higher than any Ivy League institution. They might be studying economics — stretching their quantitative skills — and also dance —stretching themselves creatively and aesthetically. Students here often double major in complementary areas — theater history and chemistry, for a different example — mixing qualitative and quantitative reasoning. It is very exciting to me that the College Curriculum is so clearly designed to foster this movement between diverse modes of work. This breadth of methods in each Arts & Sciences undergraduate degree makes William & Mary unique. And it will stand our graduates in very good stead as the future of work in every field changes. What is your sense of the university right now? How do you plan to sustain the momentum that has been built and ensure the university continues to move forward on an upward trajectory? Part of sustaining momentum is recognizing how much thinking has already happened. I’m joining William & Mary at a moment that follows years of sustained reflection by leadership and by the community, about the kind of community and leadership we aspire to become. There seems to be a strong recognition here of the value of looking backward in order to look forward. Our students are now living with a vibrant diversity — diversity of nations, of economic backgrounds, of ethnicity, of identity in many registers — which is very different from when I was in college. We know that the workplaces of the future will be equally diverse so this is a critical time for them to immerse themselves in an education rich in varying perspectives. William & Mary should be a place where everyone can thrive within, and contribute to, such complexity. We must continue to identify the barriers to making this happen, and commit together to the most effective and innovative ways to surmount them. The great news is that this community has collectively been taking stock and charting the next steps. I find it thrilling to come to William & Mary at a time when community members are talking to each other and having a dialogue that is different than they have had in the past. I’m thinking here about the conversations and efforts around the 50th anniversary of African-Americans in residence, the Lemon Project, the Task Force on Race & Race Relations, the holistic campaign for student wellness, the forthcoming 100-year anniversary of coeducation and the successful conclusion of the For the Boldcampaign. So far, what is your favorite place on campus? I’m still exploring William & Mary! Over the last three months, whenever I go out for a run or walk I discover new things. So let me flip the question back to you and our readers. Come walk with me and show me your favorite place — and tell me why you love it.